Horse riding holidays Iceland on Icelandic horses - a once in a lifetime experience. These multi-day Iceland riding tours require fit riders skilled in the walk, trot and canter. You’ll be riding with an outfitter who is a pioneer for riding in Iceland and practices sustainable tourism, so you can feel good about your trip to Iceland. Icelandair now flies from New York, Boston, Minneapolis, Orlando and Seattle, making getting to Iceland even easier. It’s about a five hour flight from New York’s JFK Airport, making shorter trips feasible too. For travelers who want to combine riding with other adventures in Ieland, the three day Countryside Adventure is a good bet. Equitrekking Travel’s preferred provider of travel services can arrange airfare and accommodations in Reykjavik and suggest other adventures in Iceland to compliment your trip. Vikings settled in Iceland in the 9th century, bringing horses and other livestock that would help them cultivate the land, explore and survive. Until the 19th century, horses were the sole mode of transportation around this rugged island. The Icelandic horses, though pony sized, are strong and agile, running over Iceland’s craggy terrain with ease. These horses have special gaits or ways of moving including the tölt, a smooth gait where the riders may feel like they’re gliding along instead of bouncing up and down in the saddle. The outfitter for these Iceland horse tours received the Environmental Award by the Icelandic Tourist Board in 2001. Featured in Equitrekking Iceland on PBS. Host Darley Newman participates in a horse drive with local farmers, explores Reykjavik, the Golden Circle and more. Please see Equitrekking Travel's General Packing List for some suggested items. Packing layers is always a good idea for any riding tour, as the weather can change quickly. • Swimsuits, towels, soap etc. Riding gear which has been used abroad needs to be dry cleaned or sterilized. Riding gear (riding boots, riding trousers, jackets, hats, gloves, etc.) needs to be washed (104°F/ 40°C), dry cleaned or disinfected before arriving in Iceland. Most veterinary clinics will be able to do the disinfecting. Saddles, bridles and other leather gear may not be brought into the country. Please understand that these precautions are necessary because there are no contagious animal diseases (i.e. rabies or foot and mouth diseases) in Iceland and therefore important to protect the animals of the country. Please help protect Iceland's fragile nature! For further information please follow this link. Substances which are approved for disinfecting and the way they should be applied are mentioned on the form. Please note that laundry is not available on these riding holidays in Iceland. Icelandic horses are an important part of Icelandic culture having helped the people of Iceland survive for centuries. The history of the Icelandic Horse can be traced to the settlement of the country in the late 9th century. The Icelandic horse appears in Norse mythology, the sagas, songs and the art of Iceland. Icelanders take great pride in the Icelandic horse, which has been pure bred for over a thousand years on this isolated island. The Icelandic horse is special because it has five different gaits or ways of moving. Besides the walk, trot and canter/gallop, Icelandic horses may also tölt or pace. The tölt is a smooth four-beat gait. Once you are into this gait, you may feel like you are gliding, instead of bouncing up and down in the saddle. The flying pace is a two-beat racing gait in which both legs on the same side move together. 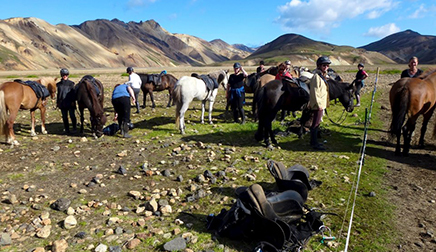 On Icelandic riding tours, you will usually change horses once or twice a day. On most of the longer tours you will ride with spare horses along in a free running herd, the traditional way of riding in Iceland. The tack used for Icelandic horses is slightly different then the tack ordinarily used for other breeds. The saddle is built close to a dressage saddle and has a relatively flat seat. Saddles come with plain or quilted seats. On longer rides a crupper helps keep the saddle in place. The riding style used on Icelandic horses is close to English riding style, but stirrups are worn longer. Bits used include mostly simple snaffles. Bridles have a detachable noseband and clip on reins. These Iceland riding vacations include sightseeing at some of Iceland's top destinations. Trips may include- time in Reykjavik before or after the ride, the hot springs area of Geysir, Iceland’s Golden Waterfalls and Thingvellir National Park, the spot where the North American and European tectonic plates meet and more. 2 - 4 bed units with shared facilities at Fossnes Farm. Rooms with private facilities for 2 nights at Geysir and 2 nights in a hotel in Reykjavik. 2 - 4 bed units with shared facilities at Fossnes Farm. Rooms with private facilities for 2 nights at Geysir. 2 - 4 bed units in summer cottages with shared facilities. Double rooms in a hotel in Reykjavik. Guesthouses and holidays farms during the ride. Single rooms may be available at an extra charge. Hotel in Reykjavik and 2 to 4 bed units at the farm for the horse drive. Hotel in Reykjavik and double rooms at Daeli Farm for the horse drive. 2-4 bed units. Accomodations in Reykjavik before or after the ride must be arranged on your own. 2 - 4 bed units in Reykjavík. Sleeping bag accommodation in simple mountain cabins during the ride. During the ride full board is provided. The menu consists of a large breakfast and traditional Icelandic meals (fish or lamb). Vegetarian meals are available if requested in advance. All riders make their own packed lunch from the breakfast table. The North of Iceland is known for its spectacular natural sights and diverse landscape. On the Norhtern Exposure riding tour, travel from Bjarnastaðir Farm near Húsavík to the Lake Mývatn area, famous for its volcanic features and rich birdlife. Ásbyrgi Canyon, Dettifoss, Europe’s largest waterfall, and the strange rock formations at Hljóðaklettar are just some of the gems of nature we ́ll be seeing on this amazing horseback riding tour. Children’s discount (under 12 years): 25% on our multi day tours. Family discount: 5 % discount available for parents and children 12 - 18 travelling together, 3 or more. Not applicable if the children’s discount is used for one family member. Accommodation: Sleeping bag accommodation in shared rooms during the ride. Bring your own! Meeting place: Reykjavík. Accommodation before and after the ride are to be arranged individually. Optional: Whale watching boat trip, fee to be paid locally. We ride along soft riding tracks ideal for “tölting”, the unique extra gait of the Icelandic Horse. The first day we spend in Jökulsárgljúfur National Park and visit both Dettifoss Waterfall and Ásbyrgi Canyon. From rich green pastureland we head towards the Gæsafjöll Mountains and spend a night in a mountain cabin at Theistareykir. Through an area scarred with cracks and fissures from earthquakes and volcanic activity the route takes us to Lake Mývatn where bubbling mud pools and eerie lava formations are a reminder of the powerful energy right beneath our feet. We have the opportunity to bathe in the warm geothermal water of the outdoor pool at the Mývatn Nature Baths. The next two days take us through Laxárdalur Valley to Heiðabær for an overnight stay and relaxation in the swimming pool on site. From there we continue across Reykjaheiði heath towards the coast and back to Bjarnastaðir Farm. After this amazing tour in an ever-changing landscape we can can let our cares float away in the hot tub at Lundur Swimming Pool before sitting down to a hearty farewell dinner at the farm. In the morning return to Húsavík by bus and a whale watching cruise for those interested. (Price per person EUR 80). Others can enjoy the town‘s swimming pool with it‘s hot tubs or just go for a stroll in this beautiful town. Afternoon flight back to Reykjavík Domestic Airport and a transfer to your accommodation. The Snæfellsjökull National Park is where you find one of Iceland ́s most beautiful and emblematic sights - the glacier-covered cone volcano Snæfellsjökull. The mystery and spiritual aura of this still active volcano were made famous through Jules Verne’s novel Journey to the Centre of the Earth. Many of the great Sagas are located in this very area. Today the remote beauty and rich bird life draw visitors from all over the world. The peninsula itself is often called “Iceland in a nutshell” because of its diversity of landscape. Accommodation: Accommodation in made up beds in shared rooms during the ride. Meeting place: Reykjavik. First night of the tour is spent at the farm. Accommodation after the ride are to be arranged individually. Note: Knee-high rubber boots are recommended for the beach ride! Experiencing “tölt”, the unique extra gait of the Icelandic Horse, is made easy for you on this tour when we follow good riding tracks. The long stretches of smooth sandy beaches make this tour a delight for both horses and riders. This Iceland riding vacation takes us through a landscape of extensive lava fields, craters and ash from ancient eruptions in Hítardalur valley. We also enjoy wide-open stretches of light-coloured sand at Löngufjörur beach, where only the tide sets a limit to the freedom of horse and man. The impressive 50-meter deep crater Eldborg is a distinctive landmark, where the light sand turns black once you reach its lava field. On our last riding day we follow the edge of the lava flow along the shore before returning to Stóri-Kálfalækur Farm. Pick up at BSÍ Bus station in Reykjavik or at Reykjavik official bus stops near your accommodation (see: www.busstop.is) between 18:00-19:00 where our Íshesta bus will transfer you and your fellow riders to Stóri-Kálfalækur Farm, where horses and staff are waiting for us. After a lovely introductory meal where we get to know each other we relax and rest so we are well prepared for the adventure ahead of us. NB: Next three days we ride on Löngufjörur beach where timings depend on the tide. In some cases we need to start the ride very early in the morning or in the afternoon. This tour was nominated by Equitrekking in CNNgo as one of the 15 greatest horse treks in the world! What better or more unique way to do the popular Golden Circle Tour than by riding through the lovely countryside of South Iceland. The three key attractions on this classic Iceland equestrian vacation are the hot spring area of Geysir, Gullfoss or the Golden Waterfall and Thingvellir National Park. Each one guaranteed to take your breath away. Thingvellir National Park is now on the UNESCO World Heritage List based on its historical, geological and cultural importance. This horse riding tour is perfect for families and those not having the required riding experience for our highland tours. Keep in mind that riding days can be long so you should be in good physical shape and have the basic horsemanship skills. On the first riding vacation day you get acquainted with the unique Icelandic Horse and its special extra gait as we take an easy trek along the banks of the majestic Thjórsá River. We continue towards Gullfoss Waterfall with its thundering waters and the hot spring area of Geysir. After a relaxed day ́s riding in that locality we next explore some of the more remote places, well off the beaten track. On our way to our accommodation we visit the charming Secret Lagoon for a well deserved bath. We cross the highland moor of Hrunaheiði and enjoy good riding tracks when trekking past iconic basalt columns at Hrepphólar on our way back to Kálfhóll Farm. Accommodation: 2 – 4 bed units with shared facilities. Optional: Snowmobile drive on Langjökull glacier, fee to be paid locally. Pick up at BSÍ Bus station in Reykjavik or at Reykjavik official bus stops near your accommodation (see: www.busstop.is) between 18:00-19:00, where our Íshesta bus will transfer you and your fellow riders to Réttarholt Guesthouse, where horses and staff are waiting for us. After a lovely introductory meal where we get to know each other we relax and rest so we are well prepared for the adventure ahead of us. Our last day of riding includes yet again terrific scenery. Today we follow good riding tracks past Mt. Galtafell. We cross River Laxá before we reach Sandlækjarmýri. We turn towards the banks of Thjórsá River and follow them to Kálfhóll Farm. (approximately 40 km) Here we say goodbye to our guides, staff and horses and return to Reykjavík, drop off at your accommodation. Approx, arrival at 19:00. Step back in time and ride along the ancient Kjölur trail as Icelanders did over the centuries when travelling to the annual summer parliament at Thingvellir, first held in 930 AD, on this Iceland equestrian vacation. Visit this historic site where the heart of the nation beats and which became Iceland ́s first National Park in 1930. When you arrive to the south, you will wisit and enjoy the Geysir hot spring area and Gullfoss Waterfall. Travelling from south to north or vice versa right across the heart of Iceland, you will find yourself traversing sandy deserts close to the mighty Langjökull and Hofsjökull Glaciers. Sheltered green valleys come as a surprise in this rugged terrain. Hveravellir is a geothermal area in the highlands where we can soak in a long hot bath under the Midnight Sun. If you want to see as much as possible of the pristine Icelandic highlands, this Iceland riding holiday, which has been in operation since 1983, is the perfect choice. Accommodation: 2-4 made up beds in each room at Hvammur Guesthouse. Shared rooms in simple mountain cabins and sleeping bag accommodation during the ride. Please bring your own sleeping bag! Meeting place: Reykjavik First night of the tour is spent at the farm. Accommodation after the ride are to be arranged individually. Pick up at BSÍ Bus station in Reykjavik or at Reykjavik official bus stops near your accommodation (see: www.busstop.is) between 17:30-18:30, where our Íshesta bus will transfer you and your fellow riders to Hvammur farm in the north Iceland where horses and staff are waiting for us. After a lovely introductory meal where we get to know each other we relax and rest so we are well prepared for the adventure ahead of us. We say good-bye to our farmer and his crew and return back to Reykjavík. On our drive back to Reykjavík to your accommodation we visit the historical site Thingvellir, Iceland’s first National Park. Approx. arrival at 13:00. Step back in time and ride along the ancient Kjölur trail as Icelanders did over the centuries when travelling to the annual summer parliament at Thingvellir, first held in 930 AD. Visit this historic site where the heart of the nation beats and which became Iceland ́s first National Park in 1930. Before heading off into the wilderness of the interior, stop to enjoy the Geysir hot spring area and Gullfoss Waterfall on this wonderful Iceland riding holiday. Travelling from south to north or vice versa right across the heart of Iceland we find ourselves traversing sandy deserts close to the mighty Langjökull and Hofsjökull Glaciers. Sheltered green valleys come as a surprise in this rugged terrain. Hveravellir is a geothermal area in the highlands where we can soak in a long hot bath under the Midnight Sun. If you want to see as much as possible of the unspoilt Icelandic highlands, this horseback riding tour, which has been in operation since 1983, is the perfect choice. Shared rooms in simple mountain cabins and sleeping bag accommodation during the ride. Please bring your own sleeping bag! Meeting place: Reykjavik. Accommodation after the ride are to be arranged individually. Pick up at BSÍ Bus station in Reykjavik or at Reykjavik official bus stops near your accommodation (see: www.busstop.is) between 17:30-18:30 where our Íshesta bus will transfer you and your fellow riders to Myrkholt Guesthouse, where horses and staff are waiting for us. After a lovely introductory meal where we get to know each other we relax and rest so we are well prepared for the adventure ahead of us. The ride starts off towards the majestic glacier Langjökull and our first stop is at the beautiful Gullfoss waterfall. Our ride today leads us to a mountain called Bláfell. There we spend the night and rest the horses at Fremstaver Mountain Cabin. Our route today leads us further to the north over the beautiful river Seyðisá. Further the horses run free with us on the soft paths of this mystical highland area. We pass the mountains Sandkúlufell and Sauðafell before reaching our destination. It is easy to see that we follow a historical route. All the way back to the early settlement of Iceland, people travelled on horseback on exactly the same trails as we do today. We say good-bye to our farmer and his crew. Transfer back to your accommodation in Reykjavík. Approx. return at 14:00. The Geysir Gullfoss Riding Vacation is a short version of the popular Golden Circle Riding Tour taking in the hot spring area of Geysir and Gullfoss Waterfall. Travelers also visit Thingvellir National Park on the transfer day. Enjoy accommodation at cozy holiday farms during this ride! Participants on this tour join the longer Golden Circle Tour for four days, but return to Reykjavík on the fifth day while those on the longer ride continue. Riding Level: Intermediate riders, comfortable during long hours in the saddle. Meeting place: Reykjavik.First night of the tour is spent at the farm. Accommodation after the ride are to be arranged individually. Note: The tour arrives back in Reykjavík at 10:30 on Thursday morning. Today we leave our riding companions in the morning after breakfast and drive back to Reykjavík. Approx. arrival in Reykjavík at 10:30. This part of Iceland is inhabited by only few people, most of them living in little fishing villages along the coast. There is a lot of diversity in this horse riding vacation starting with beautiful mountain views from the wide Öxarfjörður Fjord. The Peninsula of Melrakkaslétta, which stretches almost to the Arctic Circle, is a paradise for birdwatchers and people with geological interest. Here we are right on top of the Mid Atlantic Ridge where the North-American and Eurasian plates drift apart. From mid-June to mid-July this area is “home” to the Midnight Sun which sends its golden light over the deep fjords of North Iceland. Hosts for this riding tour are Halldór and Elín with their family from Bjarnastaðir Farm, known to many Icelanders for their excellent breeding of horses. Halldór is a respected member of his community and among other things he is a “mountain king” when the time calls for gathering up the sheep in autumn. Optional: Whale watching boat trip. Fee to be paid locally. Departure from pick up points in Reykjavik www.busstop.is to the Domestic Airport for the flight to Húsavík and transfer to Bjarnastaðir Farm. Pick up between 06:30 – 07:30. Please dress already in riding clothes and bring your passport or other identification for your domestic flight. Bus transfer to Bjarnastaðir Farm, where we meet up with the guides and horses and have lunch. During this riding day along the coast we stop at Hraunhafnarviti Lighthouse, only 3 km away from the Arctic Circle and finish of at Raufarhöfn village. Most of the 250 inhabitants of this small village live of traditional fishing and we will take a good look at their way of life here in the far north of Iceland. Today we continue to ride towards Flautafell farm which draws its name from the mountain Flautafell hovering over the area. Flautafell farm is an old abandoned farm house where nobody lives anymore. Its about 65 meters above see level with beautiful nature all around. On this exciting day we rest the horses and head out on a fun bus tour to Langanes peninsula. The peninsula is known for its rich bird life and stunning nature with rock stacks in the sea full of birds and wild life. We meet our horses where we left them at Flautafell and head towards Bjarnastaðir over Öxarfjarðar heath. The heat is about 500m above see level and around 60km long. Around 1850 there where lots of farms on the but all where abandoned after the volcanic eruption in 1875 so now this heath is very rural and you hardly ever see people there. On this adventurous day we ride beside the majestic Jökulsárgljúfur canyon. The canyon is part of the Vatnajökull glacier national park. Through the canyon you can see the longest glacier river in Iceland Jökulsá flowing from Vatnajökull glacier. On the way is the most perfect photo stop where you can see the whole canyon behind you. Before we say good bye to horses and drive to Húsavík airport to catch the flight to Reykjavik we will ride to Ásbyrgi canyon one of the wonders of nature, a horseshoe shaped canyon. The old saga says that the god Odinn from northern mythology rode his giant horse Sleipnir who stepped down on the ground and formed this shoe print. Arrival in Reykjavík in the afternoon. The beautiful Snæfellsnes Peninsula extends far out into the Atlantic from the west coast. You can find many features of the Icelandic nature in this part of the country. At Stóri-Kálfalækur Farm we start our horseback riding vacation into the mountains and enjoy the rich colours of nature in Hítardalur valley. Passing through lava fields and along hillsides we ride down to the shore and continue along the expansive beach. This traditional trail, only revealed when the tide is out, offers horse and rider an ideal opportunity to try their skill at “tölting” over long distances. Participants on this tour horse riding join the longer Snæfellsnes Tour for four days, but return to Reykjavík on the fifth day while those on the longer ride continue. Accommodation: Accommodation in made up beds in shared rooms. Note: Knee-high rubber boots are recommended for this ride. Pick up at BSÍ Bus station in Reykjavik or at Reykjavik official bus stops near your accommodation (see: www.busstop.is) between 18:00-19:00, where our Íshesta bus will transfer you and your fellow riders to Stóri-Kálfalækur Farm, where horses and staff are waiting for us. After a lovely introductory meal where we get to know each other we relax and rest so we are well prepared for the adventure ahead of us. The Trail of Hope riding vacation is an ideal opportunity for anyone wanting to enjoy a comfortable ride in a variety of landscapes. As we ride through unspoiled nature our guide introduces us to Iceland ́s heroic past with tales of bloody conflict, revenge and love from the ancient Sagas. Cantering along seemingly endless sandy stretches with the sea air in one ́s face is an exhilarating experience for both rider and mount. There ́s plenty of time to try the horse ́s unique gait known as “tölt” while enjoying nature and learning something of the rich history of this beautiful and remote area. We start the ride at Hvammur Farm in Vatnsdalur valley. Sense the adrenaline kick as we ride across the waters of Lake Hóp, driving a herd of free-running horses ahead of us. A visit to a seal colony on the North-Atlantic coast is something you don ́t want to miss. Accommodation: 2 – 4 bed units, beds with bed linen. Meeting place: Reykjavík. Accommodation before and after the ride are to be arranged individually. Note: Knee-high rubber boots are recommended for this ride. It is time to say good bye to our guides and drive back to your accommodation in Reykjavík. Approx. arrival at 12:30 in Reykjavík. This riding vacation starts along the river banks of the mighty glacial river Thjórsá, with a magnificient view on glacier Eyjafjallajökull and Volcano Hekla. The beautiful area Landmannahellir is a fitting outpost in the central highlands before going on to enjoy the colourful rhyolite mountains in Landmannalaugar, surrounded by black lava fields. Our way back to civilisation leads us down from the mountains and into black lava and green valleys. The spirited and sure-footed horses make this tour an experience of a lifetime for anyone seeking a challenging highland adventure. Accommodation: Shared rooms in simple mountain cabins and sleeping bag accommodation during the ride. Please bring your own. Pick up at BSÍ Bus station in Reykjavik or at Reykjavik official bus stops near your accommodation (see: www.busstop.is) between 18:00 and 19:00, where our Íshesta bus will transfer you and your fellow riders to Réttarholt Guesthouse, where horses and staff are waiting for us. After a lovely introductory meal where we get to know each other we relax and rest so we are well prepared for the adventure ahead of us. We leave the beautiful area of Landmannahellir and ride on towards the Herbjarnfell mountain. Today ́s route takes us over varying landscape. We ride across sanders, sharp lava, huge pumice fields in many colors and over green grazing fields where the farmers drive their sheep during summer. We stay overnight in the solitary mountain hut Klettur with perfect view of the Hekla volcano. Here we get the feeling of being “on top of the world”. (approximately 40 km). We start this Riding under the Northern Lights equestrian tour with a visit to the Secret Lagoon where you can relax in the mineral rich water. We continue to a farm located near the Geysir hot spring area and Gullfoss Waterfall. During two riding days, “tölt”, the special gait of the Icelandic Horse will be introduced to you while riding to both these magnificent natural sights. Get ready in the evenings to experience the unique tranquillity of the Icelandic countryside and gaze skywards to perhaps see green-coloured Northern Lights dancing above you (weather permitting). Accommodation: 2 - 3 bed units at guesthouse for two nights, beds with bed linen. Meeting place: Reykjavík. Pick up between 16:00 – 17:00 from pick up points in Reykjavik www.busstop.is. or BSÍ bus station in Reykjavik. The tour starts with taking a refreshing bath at the Secret Lagoon (entrance fee included, please bring your own bathing suit and a towel). After one hour in the mineral rich water the transfer continues to the farm. Meet your hosts and enjoy a hearty dinner at the farm. After dinner step outside and look up into the sky for dazzling Northern Lights. We will meet sheep farmers on their way back to civilisation after many days in the saddle, herd a big flock of sheep. It is for sure a unique sight to witness 14 thousand sheep on their way back home after spending the summer up in the highland followed by over 30 shepherds with 100 horses! You can feel the joy and the excitment as this is their last day and everyone is on their way back home. You can for sure help them out and take part in the singing and the happiness. When you participate in the Round Ups Riding Vacatoins you are experiencing the Real Thing! You will be one of the group to herd and sort the animals. Of course that means long hours outside in sometimes cold weather. Iceland in autumn has many colours and types of weather. Anticipate to be in golden sunshine one moment and to ride in rain and even sleet during the next. We therefore recommend to dress well during these tours, to bring long woolen underwear and lots of woolen socks and gloves. It is also good to bring some „quick energy supplier“ like chocolade. A warm rider is a happy rider! We drive from Hvammur farm to Auðkúlurétt Corrall where a number of people have showed up to help the farmers sorting out their sheep. We can also give a helping hand to Haukur ́s grandfather, who is 86 years old and a sheep/horse farmer at Röðull farm. Optional (not included in the tour price): ,,Réttardansleikur" dance at a nearby community centre, where everybody relaxes after the excitement of the day and celebrates yet another successful round up. On special occasions like this, our guide and farmer, Haukur, put his best dancing shoes on! Breakfast will be served and after we say goodbye the bus will take us back to Reykjavík city. We are proud to present a round up horse riding tour in the very North East of Iceland. This part of Iceland is inhabited by only few people, most of them living in little fishing villages along the coast and on farms. There is a lot of diversity in this tour starting with beautiful mountain views from the wide Öxarfjörður Fjord. The Peninsula of Melrakkaslétta, which stretches almost to the Arctic Circle, is a paradise for birdwatchers and people with geological interest. Here we are right on top of the Mid Atlantic Ridge where the North-American and Eurasian plates drift apart. On this special tour we join the farmers in north Iceland as they round up thousands of sheep from the mountains. We gather the sheep from Núpasveitafréttur and Melrakkaslétta peninsula and drive them into Katastaða communal sheepfold so the farmers can sort out their flock and take them to their farms. Local farmers have been rounding up sheep in this area for centuries. Learn from them how to manage the flock, drive sheep down hill sides, across rivers and out of sheltered valleys to their resting place for the night, only to head off again the next day to round up more. Being among the farming community and lending a helping hand in this age-old tradition of the autumn round-up is as close as you can get to the heart and soul of this nation. As participants you are joining an annual tradition and not a customized riding tour. Therefore an open mind, good physical health and the ability to work as a team is essential. Expect to be treated as one of the crowd, be prepared to pull your weight each day and enjoy the camaraderie of all those participating. Hosts for this tour are Halldór and Elín with their family from Bjarnastaðir Farm, known to many Icelanders for their excellent breeding of horses. Halldór is a respected member of his community and among other things he is a “mountain king” when the time calls for gathering up the sheep in autumn. When you participate in the Round Ups you are experiencing the Real Thing! You will be one of the group to herd and sort the animals. Of course that means long hours outside in sometimes cold weather. Iceland in autumn has many colours and types of weather. Anticipate to be in golden sunshine one moment and to ride in rain and even sleet during the next. Date 2018: Thursday – Monday, September 6 – 10. Accommodation: Sleeping bag acco. In a cozy farmhouse at Bjarnastaðir. Please bring your own! Meeting place: Reykjavík. Accommodation before and after the ride to be arranged individually. Pick up between 06:30 – 07:30 from pick up points in Reykjavik www.busstop.is. Morning flight from Reykjavik Airport to Húsavík. Bus transfer to Bjarnastaðir Farm, where we meet up with the guides and horses and have a late lunch. On the way we will stop at Dettifoss, Europe’s largest waterfall and Ásbyrgi National Park. Ásbyrgi is one of the wonders of nature, a wide, horseshoe-shaped canyon with sheer cliff faces up to 100 m high. The Peninsula of Melrakkaslétta, which stretches almost to the Arctic Circle, is a paradise for birdwatchers and people with geological interest. Here we are right on top of the Mid Atlantic Ridge where the North-American and Eurasian plates drift apart. The vegetation is ideal for the sheep and the local farmers are very proud of their stock. We say good bye to horses and staff and before we drive to Húsavík airport to catch the flight to Reykjavik we stop at Húsavík for a while. Arrival in Reykjavík in the afternoon. Rounding up sheep with the farmers in Landmannalaugar, Jökulgil and near Volcano Hekla. On this special Iceland riding tour we join the farmers in South Iceland as they round up thousands of sheep from the mountains. We gather the sheep into the Landmannaafréttur communal sheepfold close to the famous Landmannalaugar geothermal area. The yellow, reddish and greenish hue of the rhyolite mountains give this area a magical touch. Accommodation: Sleeping bag accommodation (Please bring your own sleeping bag!) in simple mountain cabins, shared by the local farmers participating with you in rounding up the sheep. Meeting place: Reykjavík. Accommodation before and after the ride to be arranged individually. Note: Some walking will be involved. Here, under the stately gaze of Mt. Hekla, we drive the sheep across the black sands, which is the ash spewed by this volcano over centuries. Local farmers have been herding sheep in this area for centuries. Learn from them how to manage the flock, drive sheep down hill sides, across rivers and out of sheltered valleys to their resting place for the night, only to head off again the next day to round up more. This is the final and well celebrated day of the round-up. At noon the sorting of the sheep starts and lasts until each sheep has been returned to its owners. Participate in sorting the sheep, pass the flask around and join in the singing and celebrating after a successful ride into the mountains. Once the sorting is finished we drive back to Reykjavík where this great tour ends at approx. 18:00. Accommodation: Beds with bed linen in 2 – 4 bed units at the farm. Meeting place: Reykjavík. Accommodation before and after the ride are to be arranged individually. Optional: Dance at the community centre in Blönduós, entrance fee to be paid locally. From the Vatnsdalur area we ride through beautiful valleys and mountains to Laxárdalur valley. Here we team up with the Icelanders and help round up the horses and drive them down from the mountains to Skrapatungurétt communal corral. When this task is complete the locals celebrate with a special round-up dance or “réttardansleikur”. We are of course more than welcome to join in the fun. The round-up continues the next day when the horses get sorted at the corral and we help in returning some of them to their home meadows. We therefore recommend to dress well during these tours, to bring long woollen underwear and lots of woollen socks and gloves. It is also good to bring some „quick energy supplier“ like chocolade. A warm rider is a happy rider! "Stóðréttardansleikur" dance at Blönduós, where everybody relaxes after the excitement of the day and celebrates yet another successful round up. Departure from the North and return to your accommodation in Reykjavík. Approx. arrival at 13:00. Join the farmers in this great autumn adventure. Ride along when they drive the herd, sort the horses and celebrate the successful return of horses and men. The varied terrain includes the highland moors, green valleys just turning into their autumn colours of burning red and yellow, deep blue lakes and rivers and Kolugljúfur gorge where a troll woman resided in the old days. From Hvammur Farm in the North we follow good riding tracks until we meet the Icelanders who have been gathering horses already for some days. We join them and help driving the herd down to the Víðidalstungurétt corral. When this task has been fulfilled the locals celebrate the successful round-ups with a ball “réttardansleikur” and we are welcome to join in the fun. The next day the horses get sorted. Experience the excitement of horses and men when the horses and foals are selected from the herd and returned to their rightful owners. Date 2018: Wednesday – Sunday, October 3 – 7. Accommodation: Rooms with private bathrooms during the ride. Meeting place: Reykjavík. Accommodation before and after the ride are to be arranged individually. Optional: Dance at the community centre in Víðihlíð, entrance fee to be paid locally. "Stóðréttardansleikur" dance at Víðihlíð, where everybody relaxes after the excitement of the day and celebrates yet another successful round up. Departure from the North and return to Reykjavík. Approx. arrival at the hotel at approx. 14:00. On this special Iceland horse riding tour we join the farmers in South Iceland as they round up thousands of sheep from the mountains. We gather the sheep into the Rangárvallaafréttur communal sheepfold close to the famous Landmannalaugar geothermal area. The yellow, reddish and greenish hue of the rhyolite mountains give this area a magical touch. Here, under the stately gaze of Mt. Hekla, we drive the sheep across the black sands, which is the ash spewed by this same volcano over centuries. Local farmers have been rounding up sheep in this area for centuries. Learn from them how to manage the flock, drive sheep down hill sides, across rivers and out of sheltered valleys to their resting place for the night, only to head off again the next day to round up more. Accommodation: Sleeping bag acco. (Bring your own!) in simple mountain cabins, shared by the local farmers participating with you in rounding up the sheep. Meeting place: Pick up points in Reykjavík. Accommodation before and after the ride to be arranged individually. Note: Some walking will be involved. We have been riding in Iceland every summer for the past 6 years. We really appreciate the big selection of tours and every year they come up with something new and exciting for us to try. The fact that all tours are run by local farmers makes this so unique and we have our favourite horses all over Iceland. We have been on riding holidays in many countries almost every year since 1989. Ever since we first found this equestrian vacation, Iceland is our top destination and we come back year after year. Nowhere else in the world can you experience driving a herd of horses through such magical nature and on every tour you enjoy the same personal service. We are four friends that went together on the Iceland riding tour last summer. It was a great tour in a fantastic landscape. Our hosts made us feel like members of their family and we will certainly be back. We have our own Icelandic horses at home but I wanted to ride the horse in its homeland and experience the Icelandic nature. Many thanks for a great tour and the best horses I have ever ridden. Riding with the herd is a true adventure. The best thing is the large selection of riding tours they offer all over the country and yet every tour is run by a local farmer and his family, that know the land like the back of their hands. This is eco-tourism at it’s best! I read in the brochure that security, quality and personal service have always been this outfitter's trademarks and I must say after this tour that it couldn’t be more true! Staff that made us feel welcome and superb horses helped make this our best holiday ever. We will be back! Fully revised and updated, this 352-page guide to Iceland presents the country's highlights in a comprehensive format, illustrated with hundreds of full-colour photographs and 16 maps. The Rough Guide to Iceland is your complete handbook to uncovering the delights of Europe’s largest glacier. From Reykjavik’s nightlife to the dramatic Western Fjords and table-top mountains to the rich birdlife of Lake Myvatn, the full-colour introduction highlights all the ‘things-not-to-miss’. From Publishers Weekly-- Originally published in 1946 and out of print for decades, this book by the Nobel Prize-winning Icelandic author is a huge, skaldic treat filled with satire, humor, pathos, cold weather and sheep. Intermediate Riders. Must ride regularly, be comfortable during long hours in the saddle and be able to handle horses in open countryside at the walk trot and canter. See "Itineraries" tab above for rates and dates for all Iceland vacation packages. Children’s discount (under 12 years): 25% on our multi day tours. 50% on day tours. Family discount: 5 % discount available for parents and children 12 - 18 travelling together, 3 or more. Not applicable if the children’s discount is used for one family member.